While that’s partially true, not everything about dropshipping with AliExpress is amazing. It has pros and cons. In this post, we’re going to tell you exactly how to dropship on AliExpress from the ground up, step by step, with little to no money. We’ll also run you through the good and bad of the dropship model so there are no surprises. By now you’ve probably heard of Chinese billionaire Jack Ma, or at least his $307 billion-dollar company Alibaba. He’s considered the Asian version of Amazon’s Jeff Bezos. Started in 1999, the company was a result of Ma not being able to find Chinese products online easily. The resulting platform enables Western buyers to connect with Chinese and Asian sellers and has revolutionized ecommerce around the globe. Alibaba, the original site, is built for wholesale purchases. Sellers usually have minimum bulk order requirements. You can directly connect with Chinese manufacturers to place orders, and payment is usually via bank transfer. 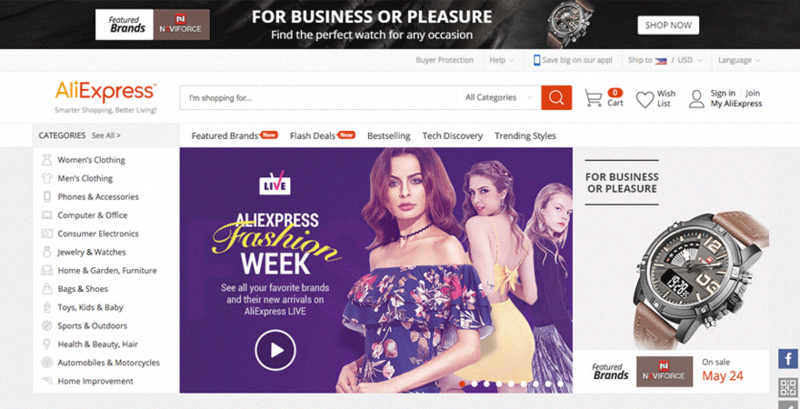 Aliexpress is its sister site. It’s made for smaller retailers who don't stock the products they're selling, and it accepts credit card payments. Think of it as Amazon, but cheaper and with a two-week delivery time. Instead of buying directly from the manufacturer, the sellers are actually third-party individuals or companies who are reselling to you. You won’t get the best price, but the buyer protection and ability to make single orders makes it perfect for dropshippers. Why do I not need any start up money or capital? Because these manufacturers mass produce goods, they can sell them for pennies on the dollar. We’re talking fancy jewelry for under $0.30 a piece, nice shirts for $1, and even electronics for a few bucks that you can resell for $50 or more. Actually, you don’t. That’s where the drop shipping comes in. You don’t have to buy a thing until you get an order on your website (which you can set up with SaleHoo Stores). So you pay for your products with the money your customers pay you. The only startup money you need is enough to buy a domain and hosting. So less than $20. Now, let’s talk about what you actually need to do. Dropshipping simply means when your customer makes a purchase from your site, you order the item from your Chinese supplier and they ship the item to your customer. You don’t need to hold any inventory or worry about packaging and shipping. Dropshipping from AliExpress requires you to first set up a store or have a place to sell your goods, like Amazon or eBay. When a customer makes a purchase, you place the order with the seller on AliExpress. The seller ships the items and you keep the difference in prices as profit. Once the item is sent to your customer, they believe it’s from you. There’s no reason to know it’s a dropshipping process. As you get bigger and scale your store, you can send in bulk orders to these suppliers for better rates and terms. That’s why it’s so important to choose the right suppliers from the start and build a relationship with them. We’ll discuss those later in this guide. For now, let’s talk pros and cons. AliExpress has a database of hundreds of millions of products. You’ll be hard-pressed to not find the item you’re looking for. Starting a dropshipping business with AliExpress is 100 percent free. Other services like Worldwide Brands and Doba charge hundreds of dollars in startup and monthly fees. This can be a huge burden for someone who is trying to get their ecommerce business off the ground with minimal funds. You control your own profit margins. AliExpress prices are extremely low and allow you plenty of profit. Product trends appear on AliExpress overnight. When a product like Fidget Spinners shows up, you can bet that you’ll be able to find it on AliExpress. Shipping can take more than a month in some cases. However, ePacket shipping to the United States and a few other select countries takes 12-15 days. Packages no longer have to be transported by boat, so transport time is faster now. You cannot bundle items. If a customer orders three items from three different suppliers, there is no way for them to arrive at the same time. It takes a few days for your credit card to be verified at first. If you set up a shop, make sure you build enough time into your first sale so you don’t have angry waiting customers. Suppliers on AliExpress may not speak the best English, which may result in communication issues. Is AliExpress safe and reliable? The great benefit of working with AliExpress is that it offers a lot of protection for buyers during ordering, shipping, and in case of returns. The site’s functions have been designed to keep the buyer in mind through every phase of the sale. It’s in the best interest of AliExpress to make sure that its sellers are legitimate and deliver the goods as advertised. However, it’s important when you’re choosing a seller on AliExpress that you take into account the company's ratings and number of products sold. There will be a lot of merchants selling the same item, so read what people are writing and only purchase from those sellers who have the best ratings. One thing you should always do as a dropshipper is reach out and contact the sellers directly. Start a conversation with them, talk to them about the product, and make sure you’re working with someone reliable. What is AliExpress’ Standard Shipping? There are multiple shipping options on AliExpress, but ePacket delivery offers the best balance of price and shipping time. Previously, items shipped from China were sent by sea, requiring up to 2+ months for delivery in some cases. As a dropshipper, you can’t keep your customers waiting that long. If you do, your customers will either cancel their order or leave bad reviews, neither of which is good for your online business. Thankfully, ePacket shipping has been introduced for Hong Kong and China, allowing for your customers to get their drop shipped goods in 12-14 days. ePacket delivery is available for goods up to 2 kilograms (4.4 pounds) in weight and with a value less than $400. Other than the shipping time reduction, the other benefits of ePacket shipment are that you can provide your customers with end-to-end tracking. Customs duties are already paid for, allowing for quicker delivery direct to your customers. ePacket delivery was once only available to U.S. customers, but has now been expanded to a growing list of more than 30 countries. Meeting your customer's shipping needs will be one of your customer’s biggest priorities as a dropshipper. That’s why it’s especially important that you spend the time to find a good supplier and change suppliers if they aren’t using ePacket delivery. Your customers are used to Amazon and other services where they can get their goods overnight. This is one of the biggest reasons they’re so successful. The more you can lower your shipping time, the greater your customer satisfaction will be. So make sure you spend the extra fees for ePacket delivery and ensure your customers get what they want in a timely manner. How to find and choose products (niche) in AliExpress? Choosing a niche and selling online should be a relatively simple process and can be broken down into three easy steps. However, implementing them in real life can be a lot of work. The easiest way to start selling products is to find a hot market. What are people interested in right now? What trends are big? What is the hot item at the moment? You need to find a market where people are spending money and which they are passionate about. Next, you need to find out what your customers are having problems with. Take advantage of social media to reach out and ask your customers what they’re having trouble with, then think of how you can help them using products from AliExpress. Try it right now. Think of an issue you’re having in your life. Do you need a swimsuit for the upcoming summer season? Or are struggling to find the perfect gift for your significant other? These are all real struggles that you and many other people go through every single day. If you listen to people, they will tell you what they need, even indirectly. Be open to their struggles, what they want to achieve. You need to be empathetic to their needs and work to understand them. Finally, use your online store to offer your customers what they want. Well, maybe not in practice. When you first start an online business, the hard part is finding a product, or coming up with an offer that meets customers' needs and creates a strong impulse to click that buy button. People want more than a product in their shopping cart. A product is a commodity that can be easily replaced with something similar or cheaper. When entering a niche, try to stand out. In any business model, it's important to offer something of value other than just the product. For example, if you are selling coconut oil, give people a recipe book with different ways they can use your product. If you can create long-lasting value for your customers, they will buy from your ecommerce store over and over again. Give your customers what they said they wanted. The great thing about AliExpress is that you can complete Steps 1 & 2 on its site. You can find hot markets and come up with product ideas by going to AliExpress’ Bestselling page. Here you can see all of the top AliExpress products in different categories and look for an item or similar items that you might want to bundle together. In the product listings you can delve further into customer reviews, view pictures they took, and discover any differences there may be between the product listing and the actual product upon delivery. This last point is extremely important; many pictures or descriptions can be deceiving, so it's absolutely important that you verify through reviews or by buying the product yourself. But what if you want to skip the hard steps and quickly find what’s working right now? SaleHoo has a Market Research Lab, a dropshipping tool similar to search engines that displays AliExpress’s best sellers, along with Amazon’s and eBay’s best sellers, to show you the hottest products on the market. You can also use it to see how often the dropshipped products are selling, and find the best suppliers for those products. Also read: 40 dropshipping business ideas to make money from your own home [Aliexpress suppliers included]. In 2017, there are many third-party applications that make it easy to import items on AliExpress into your store. If you have a Shopify store, you can use Oberlo, which is extremely easy to use and set up. All it takes is a few clicks to import all information, specs, and pictures into your store. If you are using BigCommerce, check out the AliExpress Dropshipping app, which has a free three-day trial and is just $10 a month after that. Take time to write your own copy for titles, product descriptions, and other content. Your marketing is what will sell the product, so make sure it’s awesome. Choose high-resolution pictures that don’t have any branding and are shot against a white background. Make sure you mark the price up enough for you to be profitable (at least a 100-150 percent markup). Offer other incentives like free shipping or a discount on the customer’s first order when they sign up to your mailing list. Work with a web designer and learn search engine optimization (including Google AdWords) so your product pages will be ranked higher on search results and be seen by your target market. Once you have your dropshipping store using AliExpress up and running, orders should start coming in. If you’re using Oberlo, processing orders is really easy. It just takes a few clicks to process, ship your order, and add tracking info. Make sure that you use ePacket shipping though, as for some AliExpress sellers it's not the default option. The same goes for the BigCommerce AliExpress Dropshipping app, a few clicks and the orders are processed and paid for, with tracking information added later. When ordering products through AliExpress, it usually takes 24 hours for the order to be processed. During this time, your order will remain unfulfilled. Once the item is paid for and shipped you have to update the customer’s order information, adding the tracking info and sending them a receipt email with this info. Because AliExpress is a worldwide service, it offers a wide variety of payment methods. Credit cards are the most common payment method. AliExpress accepts Visa, MasterCard, Maestro, and American Express. The biggest benefit of using a credit card is that in case returns and refunds are not given or you receive a poor product on AliExpress, you can always file a dispute with the credit card company and request a chargeback. This protection is not available on some of the other types of payment and should be a must for any dropshipper. When you first sign up it takes two to five days for AliExpress to verify your card details. During this time you won’t be able to process any orders. 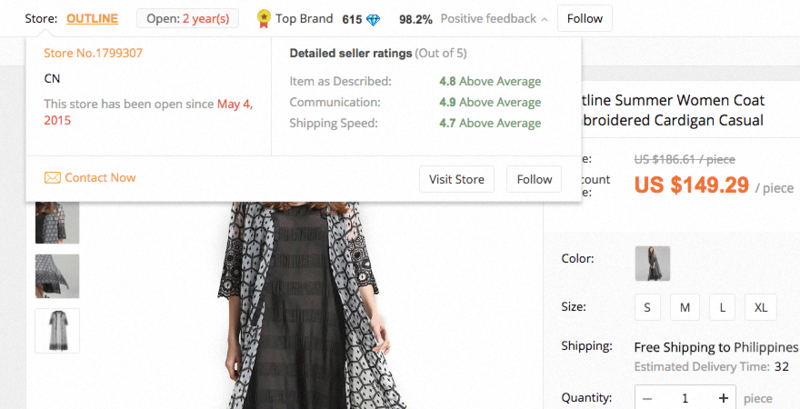 AliExpress’ Buyer Protection Program has been designed to favor buyers over sellers. The company wants to ensure that you get exactly what you order and protect you at every stage of ordering through delivery. However, be aware that many suppliers will not offer refunds. You will have to factor that in as a cost of your business. When there is an issue, it will probably be because an order doesn't arrive or it doesn’t match the description. If the order never arrives, AliExpress will refund the entire purchase. You’ll have to wait for the end of the delivery period, which is around 45 days, to receive your money back. If the order is not as described, you can return it to the seller to get a full refund, or you can let the customer keep the item and offer them a partial refund. In this case, you’ll have to work with both the AliExpress supplier and the customer to make sure the latter remains happy. The customer will have to provide photos of the damaged or non-matching item in order for you to be able to make the dispute. In any case, there are many options for you as a dropshipper. Just be aware that your business needs to have some liquid cash reserves to continue making orders in case there are a lot of return requests. Hang in there - we’re almost done! Before I leave you guys to start your own dropshipping business, here are three final tips to help you succeed in your new dropshipping venture. Tip #1: Ask the supplier to NOT include a packing slip, invoice, pricing or samples. While some of your more savvy customers will probably work out that you’re dropshipping your products, you should do what you can to make this less obvious. One way of doing this? When you place your order, add a note and request for your supplier to not include any promotional or packing slip materials in the package. Tip #2: Avoid selling items that infringe on copyrights. ...but I’d recommend avoiding these like the plague. If you don’t state (explicitly!) that these are copycat products, you could get gullible consumers who purchase them, thinking that they’re buying discounted branded items. When they eventually get their item, and realize it’s not the real deal, be prepared to have your inbox flooded. ...but this just feels like you’re asking for trouble. I mean, famous designers rarely sue small-time eCommerce stores, but you never know. At the end of the day, it’s much easier to just sell non-branded items! Tip #3: Use the AliExpress affiliate program. Still not sure whether you want to take the plunge into the world of dropshipping? You set up a website and promote various AliExpress products on this website. When your readers are interested in buying the product, they click on the links on your website, and they’re redirected to AliExpress. When they make their purchase, the AliExpress merchant pays you an affiliate fee. ...you don’t need to place orders, deal with enquiries, or handle returns. And you’ll get a minimum of 8.5% commission! In comparison, Amazon affiliates get 4% commission on average - so AliExpress certainly isn’t scrimping when it comes to rewarding their affiliates! It doesn’t matter if you’re living in a 1-bedroom apartment and have no space to keep your stocks. Hell, it doesn’t even matter if you’re living in your mom’s basement. ...and you can get your dropshipping business set up. Plus: 22-33% of online retailers have adopted dropshipping as their primary method of order fulfillment. This means that dropshipping is a tried-and-tested model, and one that’s definitely profitable. Time to stop being a salaried employee, and start building a business you can call your own. If you liked this article, please take a minute to share it with your other friends who are thinking about venturing into eCommerce! Oh! My God! I'm overwhelmed and don't know where to start. Help! can these apps be used with amazon? I don't think Aliexpress provides a reliable business model. Here's my experience with Aliexpress after becoming an A4 buyer within less than 6 months and after hundreds of orders. I had my account suspended then terminated 6 days ago. I contacted customer support 5 times to no avail. The first reason they gave me was: account temporarily suspended due to security reasons. After contacting the infamous customer support and promising to do their best, I got the second email with a new reason this time: My account is terminated due to violations of the order protection program. This happened and I'm an A4 buyer with 50 ongoing orders! Now I cannot dispute or leave feedback for any of them!! Simply thift!! Moreover, the fact that I returned the money to some of the sellers after a dispute/refund did not seem to matter at all. I did this voluntarily after receiving some of the disputed orders after some 3-4 months!! I still had respect and returned the money through another purchase and none of that mattered! I'm beginning to think that some of the highly rated/recommended sellers have close connections to AE management and are untouchable! I doubt their rating system so much after noticing that some of the most decent sellers are not highly rated at all. I've set up a few (4-5) shopify and wordpress ecommerce sites selling mostly aliexpress items but have yet to really make any money. It just doesn't work. I've spent hundreds of dollar using facebook ads (start out at $5 a day) but that doesn't do much. So what is the trick? Maybe the market is saturated? I really wish this worked. I was going to try and sell from Salehoo directory but the wholesale price for items is higher than what I can sell on amazon or ebay. I'm pretty much in limbo trying to figure out what to try next. Hi Kendrick! My experience has been that Facebook ads don't pay off, though there are plenty of people (even on the SaleHoo staff) who would disagree with me. Consider other advertising methods like AdWords. Also, make sure that your site is optimized to convert—if visitors have a hard time finding their way around it or don't feel safe making a purchase, then it won't matter how much traffic you get to the site. Note that the prices you find on wholesalers' sites are often retail prices, not wholesale prices. If you haven't yet, try contacting the wholesaler directly. They'll often only tell you their wholesale prices when you reach out and prove that you are a real business interested in making a deal. You can also negotiate for lower prices. Mr. Justin, Many Thanks for your articles and advises. I am running few sites including http://www.supersoko.trade which is an affiliate site for AliExpress and other suppliers, but the main challenge we are facing with traffic and converting traffic. Can you suggest any better source or idea? thanks. Also please reply for the last comment by kendrick. One thing I noticed on your site is that you have a blog, but it isn't set up to gain or convert traffic. Rather than reusing spun articles, try creating 100% unique, well-optimized articles that both offer useful information to visitors and make people want to buy your products. And don't forget to link to at least one relevant product or category in every article. Also, make sure that you don't have any empty categories on your site. I tried looking at your adult collection and I couldn't find any products to buy, and there was only one entry with no pictures. That sort of problem will cost a lot of conversions. I hope that helps—good luck! It's a good review but, I'll appriciate if you can give more details with any example about how much money do I need in reserve in case that many refund occur if I got 25 item in my store. For me, that's the vital part in order to keep alive what I just started. Using WooCommerce, what is the best option to import products from AliExpress? I have my own website and I want to dropship computer/electronic products. I started using Novatech Wholesale importing over 7,000 of their products/images and had to stop due to a lack of reliable support. If I want to use AliExpress and import their products into my website, how would I do that? I have an account with them, but I don't see how to get their products in a file that I can use. Remember you can sell pretty much anything you wish, to help you off to a good start, here's a guide featuring a few ideas of possible niches/items you could look at selling. Also, discussed in the guide are the pros and cons of each on. The guide also has some suppliers listed for each featured niche - please note that this requires SaleHoo membership to access. Another tool I suggest you check out is the SaleHoo Market Research Lab, once you're a member. It is designed to help you research top selling products across all categories. For each product a list of potential suppliers is available for you to check out as they are likely to stock the specific (or similar) product. If you have other concerns please feel free to let me know. Happy Selling! That all depends on you but you have to add a considerable amount of products. As for whether you will pay before hand of not, it depends if you are sourcing your products via dropshipping (pay only when the product sells) or via wholesale you need to purchase your products in bulk before you can list them in your store. I have created a website for drop shipping and its through woo-commerce. I created my home page but still hesitant to drop-ship or affiliate program. Of course I want to maximize my income but don't want to get to far ahead of myself and not be organized. Should I get it all set up and order something from my own site first to test it? Also, do I need the Aliexpress plugin also? As to what you can add in terms of plugins, it would be best for you to check with your store's support team. As for filling your store with products from a dropshipper, I strongly suggest you do :) Remember with dropshipping you only buy the product once you have sold it to your customer. You don't necessary need a website to start dropshipping. You can sell on online marketplaces like eBay and Amazon. Some even try selling off Facebook. It is best that you accept payment methods that shoppers consider as safe, like credit cards or PayPal. Hi. I have a question about adding the Aliexpress e-packet tracking number to the paypal payment, and including adding it to each order on my site, after receiving an order. Customers will know right away the item is coming from China when they see the e-packet tracking number. Is there any way around this, so they do not know? I think there is no reason you should hide the country of origin from your customers, it's even better that you disclose this to them. How can I use their money to place the order? i still have the confusion and search more for it but didn't get any answer of it. so hope you'll help me with it. I'm gonna use own domain and WordPress hosting i got to know that AliExpress also offering paid plugin for WordPress. i felt it's a good option as oberlo works on Shopify i think it'll be working on WordPress. but my doubt is that how the further process work suppose i got an order on my site after that what needs to be done. I'm wondering that it's plugin so it'll be automatically placed on AliExpress too am i right ? if yes even though how it'll work. I'm wondering many thoughts. but what matters is what and how it actually gonna work. so you told everything what needed and bla bla.. but what after getting order how it works how do i get the extra money which I'll charge extra on product. you told at one place that for better experience should contact supplier but i didn't get clear on it. is it gonna happening like to contact supplier every time for every single product. i told you my doubt please tell me exact anwers it's procedure after having order when using it's plugin on WordPress.